I get a lot of grief talking about balls all the time... But, when you experience the Roll Model® therapy balls for the first time, you'll be talking about them all the time, too! 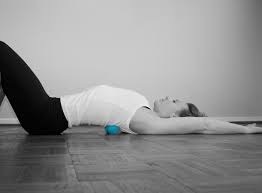 During our sessions, I'll teach you to use these high-grip, pliable, rubber therapy balls in focused movement routines that help penetrate through layers of skin, fascia, and muscle to deeply massage your high-tension areas. This will increase proprioception and reduce tension and pain.